It may be controversial to say this, but I really believe, that right now you have all the self-belief you’ll ever need. Self-belief is described as having confidence in your own abilities and judgement. So you’re probably thinking, how can she say I have all the self-belief I ever need when I still doubt myself at work, as a parent or in relationships? The reason I believe this is because we’re all born with the same levels of self-belief; you never see a baby needing therapy do you? Then as we go through life and experience negative situations we get caught up in unhelpful thinking that hides our natural self-belief. 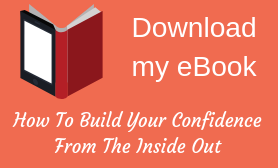 Rather than trying to boost your self-belief with affirmations or positive thinking, I suggest we just need to get back in touch with that hidden confidence and self-worth. What can I do when I doubt myself? What will people say if I do or don’t do this? The words you’re hearing and the feelings they give you are just thoughts. They’re very unlikely to be true and you don’t have to engage with them or act on them. As we get less caught up in our unhelpful thinking, we get more in touch with our self-belief and start to be braver, more resilient and to accept ourselves as we truly are. Then you’ll realise you’ve got all the self-belief you’ll ever need. That’s a mindset I’d love to have, what about you? If you’d like to find out how you can get back in touch with your self-belief and confidence then you can book a free call with me. We’ll discuss your current situation, what you’d like to achieve and I’ll give you some suggestions on how to move forward.